Apart from the alluring beach resorts and the scenic coastline, Costa Almeria boasts some supremely unusual natural landscapes and the many historic attractions of Almeria City. The region is a delight for movie buffs, as both the city and the desert surrounding the village of Tabernas are favourite locations for film shoots. 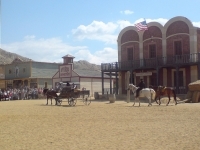 In fact, the movie sets built in the town are now theme park attractions, and, oddly, the European desert is the perfect place to get a taste of the American Wild West. 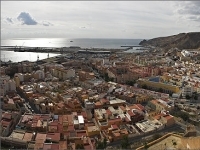 Almeria is dominated by the massive Alcazaba citadel and has an interesting Old Town and a great archaeological museum to keep culture vultures busy. 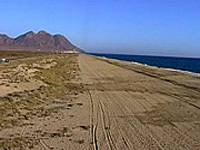 However, the arid desert landscapes, volcanic mountains and coves, and unexpected wetlands and lagoons are the main attraction of the Costa Almeria, drawing active and adventurous nature lovers to mountain bike, hike and scuba dive in the Cabo de Gata-Nijar Natural Park and all along the coast. The huge reserve also contains some historic ruins, quaint fishing villages and spooky abandoned towns to explore. The picturesque village of Nijar is a particular favourite with travellers and a good place to go shopping for arts and crafts in Costa Almeria.